It was a lot of up. It took me 51 minutes to get to the top. I might have made it a few minutes faster but, as always, there were too many cool things to stop and see. The very coolest was a 2-3″ burnt orange and brown butterfly that, despite the few soft freezes we’ve already had, was fluttering around the top third of the mountain. It flew too fast for me to identify on the way up, but blessed me on the way down by landing on the side of a large pine tree where it was silhouetted against the sun. No color was visible, but I didn’t need it – the curled and fluted edges of its wings were highlighted by the setting sun. There are only two butterflies in this area with such elaborately shaped wings: the Question Mark (Polygonia interrogationis) and the Eastern Comma (Polygonia comma). 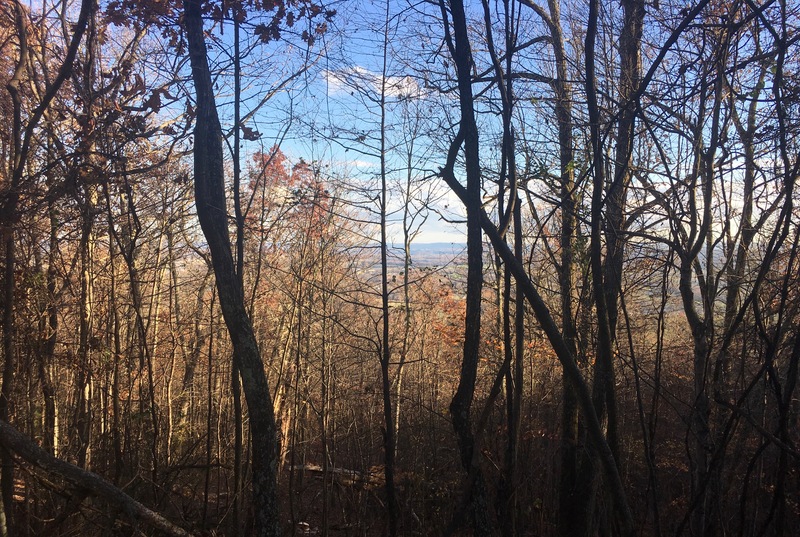 Both are found in open woods (which the forests on Brush Mountain really are, now that the undergrowth has died down and most of the leaves have fallen), both have a season that lasts through November, and both are shades of orange and brown. 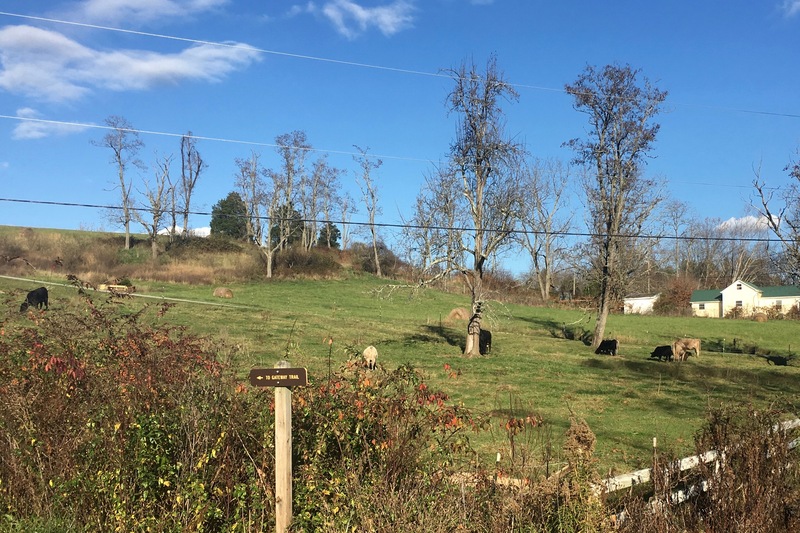 Honestly, it could have been either one; and though I’d like to have a definite, positive ID, either way I’m overjoyed to have seen one (only my second since living here in the NRV). That was the only moving wildlife I saw on the whole hike, though I’m not shocked that my big, clomping feet and my heavy breathing scared all of the other critters away. I did hear a few things up on the mountain, though, the alarm calls of a songbird, letting all of its friends know that there was a dangerous, heavy-footed human about (as if they hadn’t heard all of that heavy breathing anyway); the chirping of crickets from up in the trees (snowy tree crickets?) and, best of all, the low, gravelly calls of ravens. I have a thing for ravens. I first noticed them and became aware that they lived in this area my first year out of college. My husband and I rented a little country house off of Ironto Road. My parents visited us there a few times and my mom and I used to watch the sunrise. (This was well before I had my kiddo – when sunrise was still a non-offensive hour to awaken.) She and I spotted “the biggest crows ever” feeding in the fields behind the house one sunrise. I’ve been enchanted ever since. Crows are noticeably huge-er than crows. They’re incredibly intelligent. They act as excellent wild area janitors by cleaning up all of that troublesome dead meat leftover when an animal dies. Not to mention that my favorite scary storyteller, Edgar Allan Poe, wrote a mind-melting poem about a raven. I highly recommend both the poem and the bird. I made it back to the car just as golden hour turned to dusk. I left my stress and, truthfully, most of the thoughts in my brain, up on the mountain. It’s big, it can handle the extra weight. I came away lighter, carrying only a feeling of accomplishment and the following pictures on my phone. Cows grazing leisurely greet me as I turn left from Meadowbrook Road to continue on to the trail head. I love this little barn. 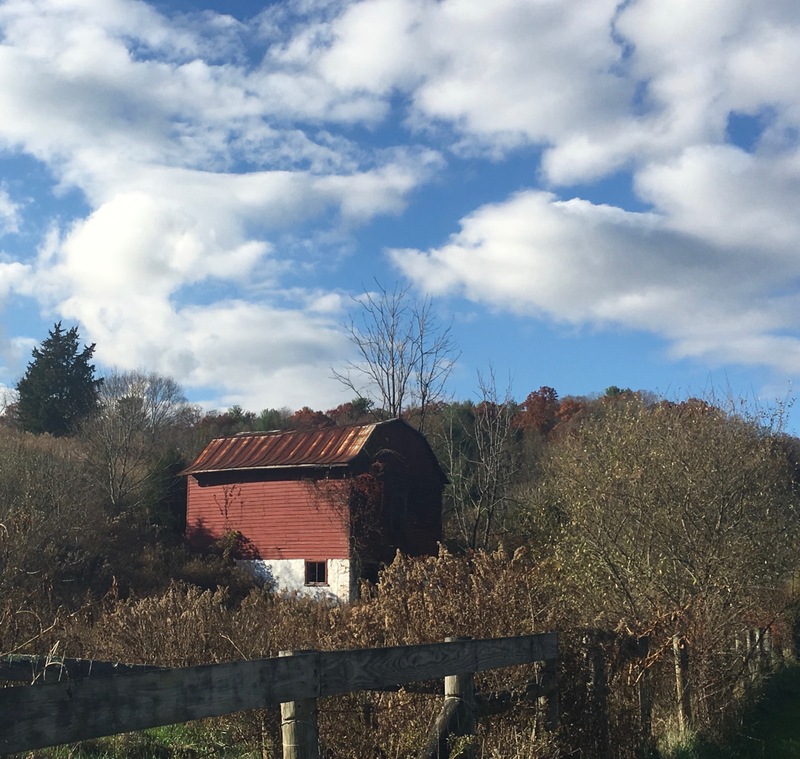 It’s barn-colored, a rusty, brick red that seems welcoming and warm against the clear, chill blue of the autumn sky. 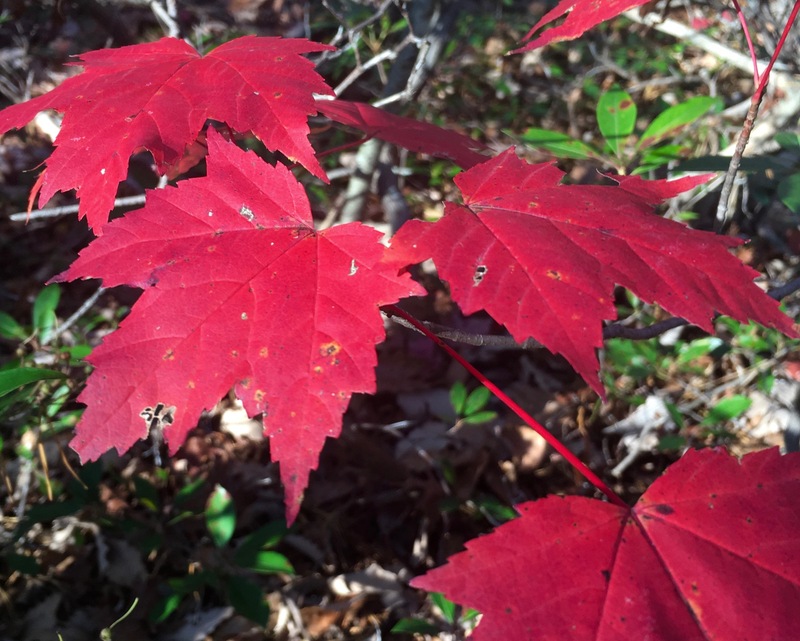 Though most of the deciduous trees are already bare, a few crimson leaved specimens highlight the mountain trails. Here is a young maple, showing off it’s cranberry foliage. The anthocyanins are the red pigments in leaves (unlike the orange and yellow pigments) that are are manufactured only in the autumn as light decreases and temperatures turn cooler. I also love polka dots. 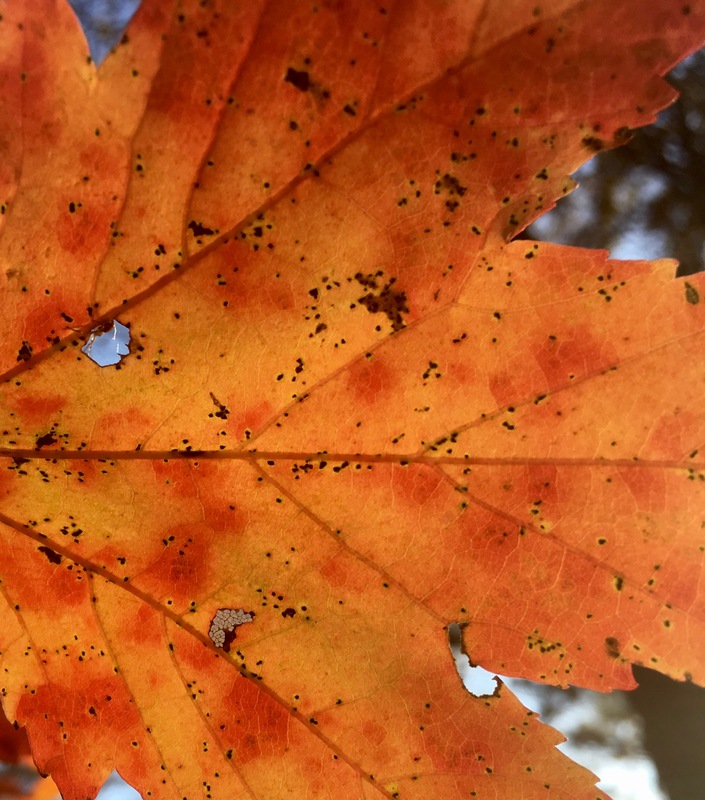 This maple leaf seems to have made its own cherry dots to decorate the background of orangey-yellow made by carotene and xanthophyll pigments that are there all year, hiding under the green of chlorophyll. I much prefer the view from the top of Brush Mountain to any I’ve seen from a tall building. 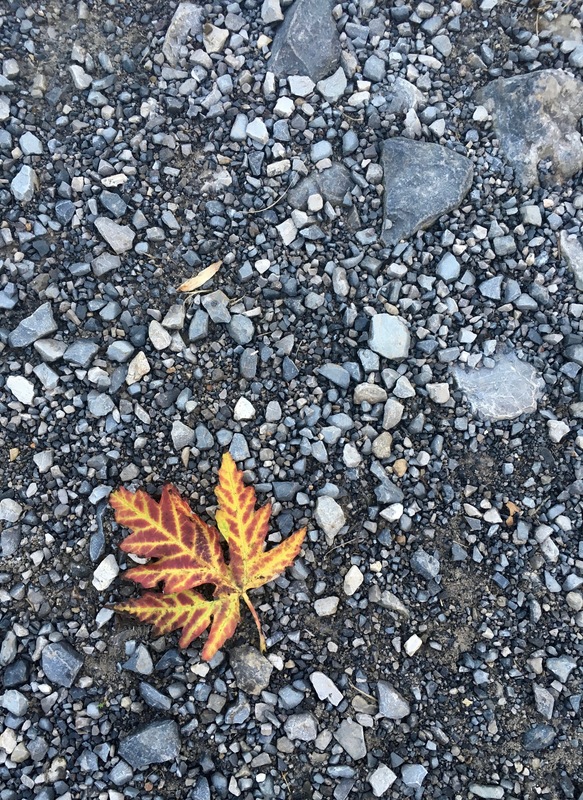 As I made my way from the trail head back to the gravel parking lot, one more maple leaf found a way to stun me. The reds, oranges, and yellows leap out from the dull gray gravel. This was a better gift than receiving a medal for the hike. Though, if anyone’s offering, I wouldn’t say no to a medal! Your beautiful photographs remind me that even when sumptuous autumn has peaked and the trees have again become skeletal, the foliage you do still find assumes the role of the Prodigal Son. What treasures these leafy jewels are. Our temptation to fall into despair can be thrashed by attention to what does indeed remain–the odd leaves, the dark silhouettes of limb and bough, and the return, by the way, to easier sightings of the wildlife with none of the foliage masking them..